Haven't heard from you in a while and I noticed your Orc wasn't included in the Hoard for January (dang it, I was looking forward to it). Hope everything's OK with you and hope to see more of your awesome work in the near future! Thanks, mate. Yeah, life got in the way and I didn't manage to finish the fig. Though as it turns out something Jim said made me rethink the image and I've redone it with (I think) a more miniature-like look to it. Just need to finish off the back view and I can colour and compile it, hopefully in plenty of time for this month's Hoard. I think it definitely looks more miniature-like. Nice job! I really like your style and would love to see you develop a whole line of fantasy figs! Yeah, that's what I intend to do eventually; I've got a whole fantasy world that I've been trying to write a novel about for years with little success. Part of my reasoning with the figs is that they can help me solidify the look of that world, and the races and characters in it. Maybe playing a few games could even help me with plots. 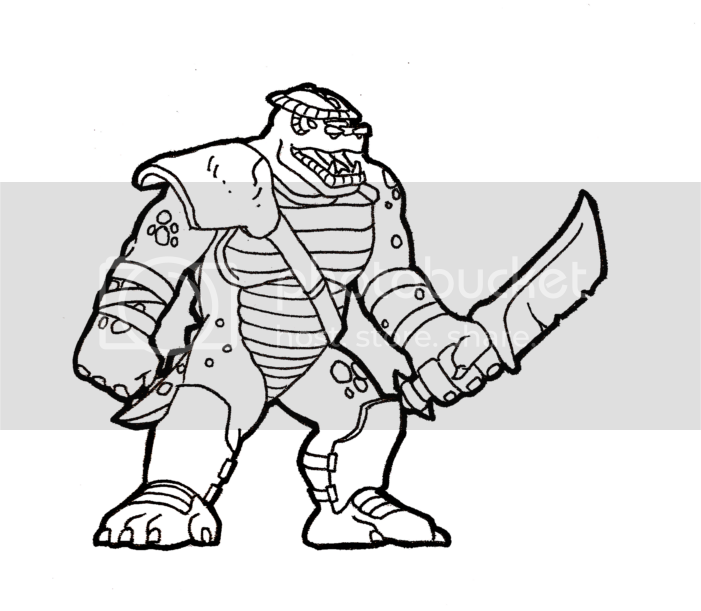 I've got rough sketches down for some other orc troop types, as well as other Grune (goblins, dragons etc).